We are looking for PMQG members to share their knowledge, we are looking for your ten minute tutes. The ten minute tutorial; It can be hard to know if your tutorial can be done in ten-minutes but don't worry too much - it is a general guideline, a way to say "this doesn't have to be crazy-involved". It can be hard to know if this object or technique you know is known by everybody but don't worry too much - sure some of us might already know it, but some of us might not. Our guild is made up of every skill level and doesn't it feel awesome to share a tidbit of knowledge. You might open eyes to an entirely new way of doing the same thing, since there is always more than one doing things…. 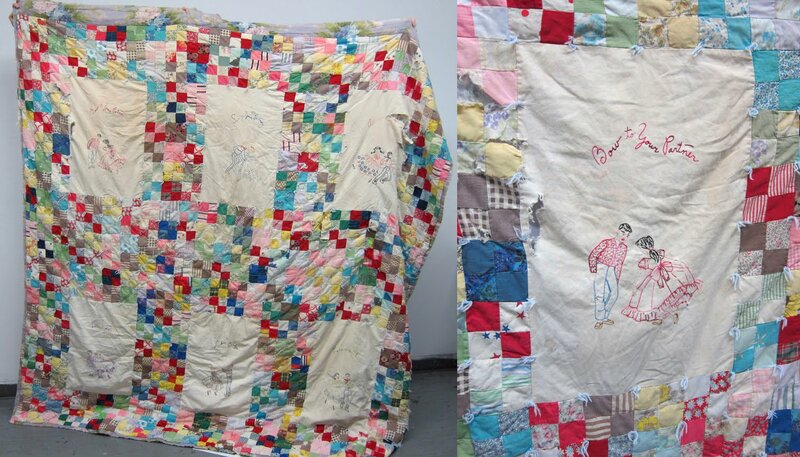 So far we have seen new methods of quilting with a walking foot (more than straight lines! 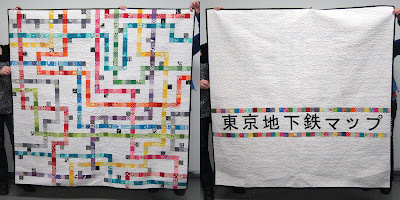 ), zipper installation (just one method, among many), pillow making, notebook covers, hand quilting, glue basting and surely I'm forgetting a few. Do you have an idea for a ten-minute tute? Something you'd be willing to share with fellow PMQG members or even something that you'd love to learn in a ten-minute tutorial, please let us know by emailing portlandmodernquiltquild@gmail.com. 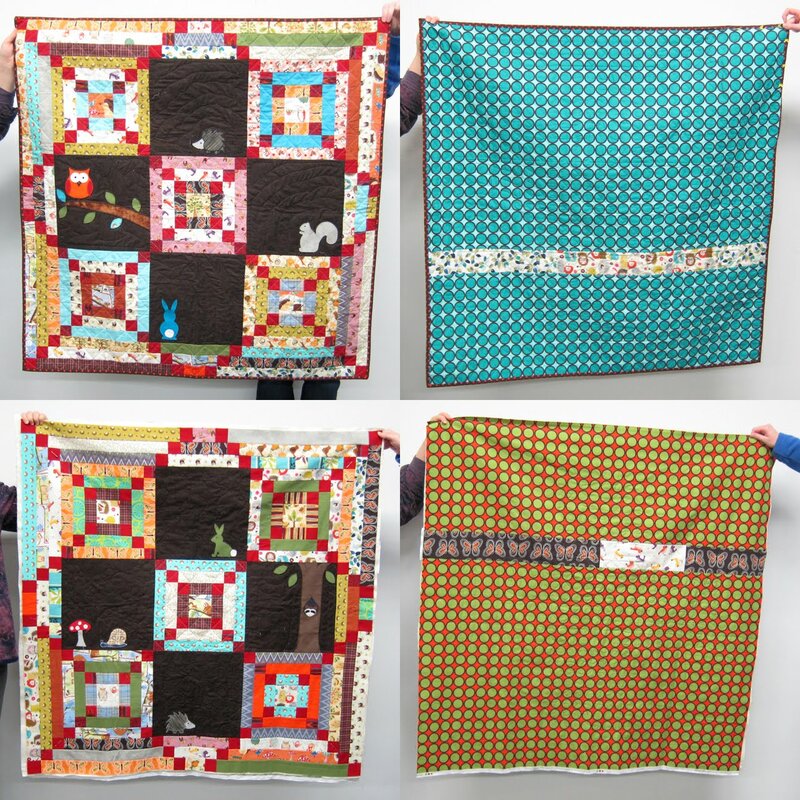 At the moment we are hoping to hear about your favorite quick sewn gifts; but all ideas are welcome all the time and we will work with you to figure out the best time to present them. Come on and speak-up, we are waiting to hear from you. A new year, new officers, new ideas. Last night's meeting kicked off with a warm welcome from President Christina and quickly segued into Cherri's 10-MINUTE TUTE. 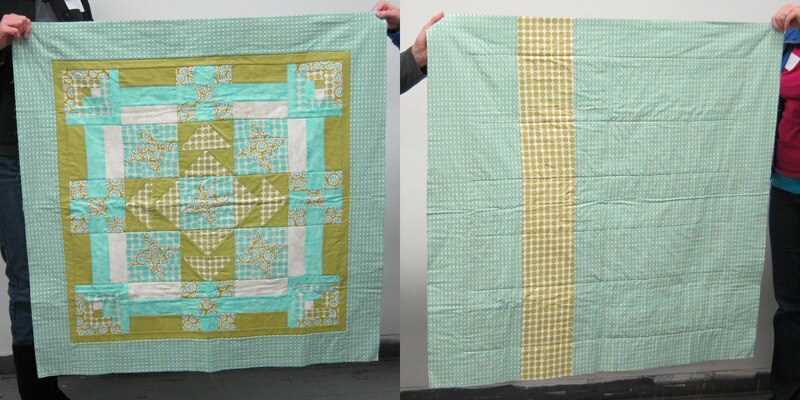 "Wonky Argyle Quilting." Find the tutorial on her blog, Sew On. Cherri also had an extra special announcement. 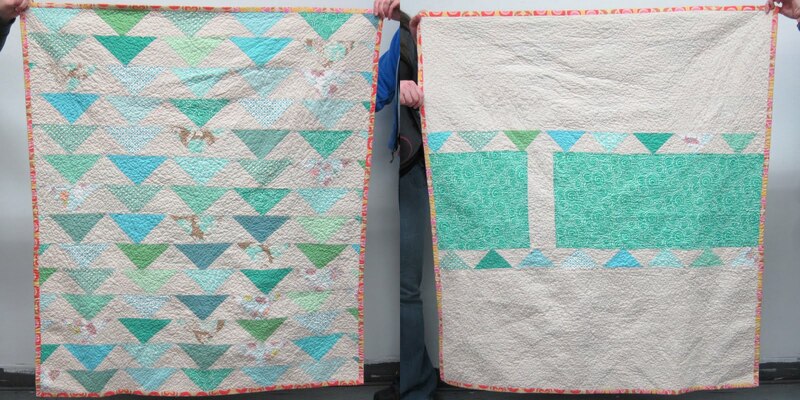 She has recently become the ecstatic owner of a long arm quilting machine—and needs you to help her celebrate. Details on her blog and Flickr. A goal for this year's officers is to create happiness, inspiration, friendship, and excitement. In order to do so we arranged a brainstorm where members counted off into eight groups, chatted among themselves, and then shared their wish lists with the entire group. Everyone provided fabulous ideas and we cannot wait to implement them. Megan, program manager, arranged five fantastic give-a-ways: 1. Tammis Keefe fat quarter pack (4 yards!) donated by the Fat Quarter Shop, 2. gift certificate for a free year of Fat Quarterly. (Member Christina, The Sometimes Crafter has a FQ review on her blog. ), 3. & 4. $10 Cool Cottons' Gift Certificate, and 5. $5 Cool Cottons' Gift Certificate! How we love to share—keep 'em coming ladies! THANK YOU PNCA for a year of hosting PMQG meetings! get your membership today and get sweet deals at some of your favorite stores! Phew—until next time my sewing friends, as Cherri would say "sew on!" Zombies and Halloween go together like pins and pincushions, so The Happy Zombie was the perfect choice for an October presentation to PMQG. Of course, a little sustenance for our favorite zombie before the meeting seemed appropriate as 43 members settled in for an evening of fun, friends, fabric and inspiration! Sweets and liquid courage supplied by Jen. After new members and visitors were welcomed, Program Chair, Cherri Langley, announced that dues of $25 per year would start in January 2011. Meetings will remain free; however, benefits of being a dues-paying member will include such perks as free all day sewing days, a mention in the blog sidebar, and discounts at fabric shops. 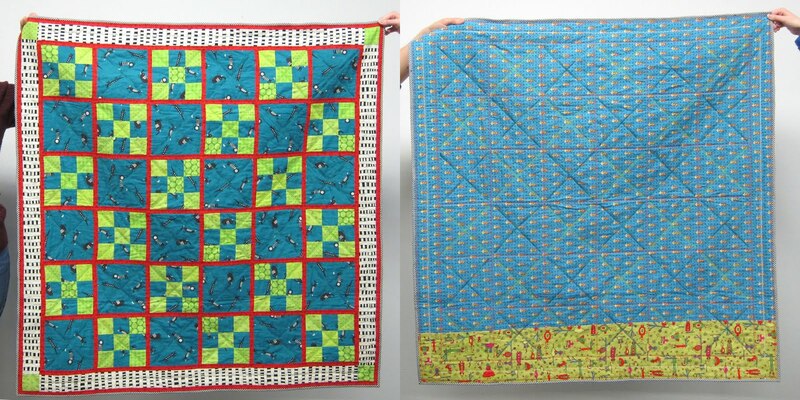 The dues will help fund special events (e.g., bringing in out-of-state speakers for workshops/trunk shows), paying national Modern Quilt Guild dues, etc. Although the dues go into effect in January 2011, members may submit dues to Tamara (PMQG Treasurer) at the November meeting. Michelle also showed a beautiful binder that she uses for other sewing organizational and reference purposes, including a stitch sampler, pocket for her sewing machine manual, etc. Thank you Michelle for sharing your functional and creative ideas! Enjoy your gift certificate to Cool Cottons. Monica was inspirational and entertaining, with plenty of amusing stories to tell. 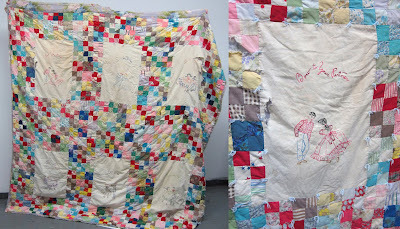 Monica Solorio-Snow was discovered (much like Lana Turner) after years of drawing and playing around with design (since 7th grade in Mrs. Gruffman's class. My apologies to Mrs. G. if the name is misspelled). 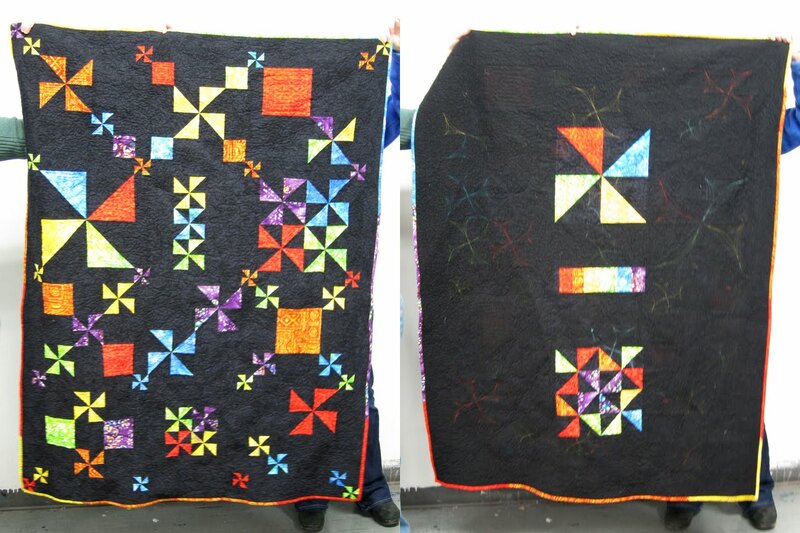 Copies of Monica's Glow Happy quilt pattern were provided at the meeting. Monica designs for Lecien. Her current line is Holiday Happy, with another line coming out in 2011. The cute bag in Holiday Happy fabric was made for Monica by her friend and partner-in-crime, Pam (aka Pam Kitty Morning). 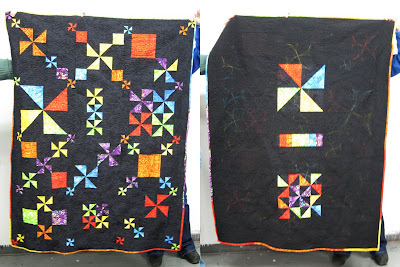 In addition to fabric, quilts, and other sewing projects, Monica showed the group some beautiful Lecien Cosmo embroidery floss and how to make a portable design wall. Monica donated several giveaways for the evening, including fabric and the portable design wall! Thank you, Monica, for great inspiration and keeping us in stitches! What could be in these plain, brown bags? Sprinkled throughout the evening were a variety of giveaways (with some donated by Monica and Elizabeth): fabric, a quilting magazine, fabric, the portable design wall, fabric, Elizabeth Hartman's book (The Practical Guide to Patchwork), fabric, a mini Halloween tote, and -- of course -- more fabric! *This meeting will feature a fabric, materials, and craft swap and sale. "Vendors" may bring their goodies as early as 6:30 to set-up; however, the doors will be closed to "shoppers/swappers" until 7:00. If you plan to bring items to sell or swap, please contact Cherri via this discussion page on flickr. Her email is also available on that page. *There will be a Give and Get Gift Swap starting at the November meeting and ending at the December meeting: Fill a sandwich size ziplock bag with pieces of your favorite fabrics -- any size -- as long as it all fits in the baggie. Write your name and email address on a tag and enclose it in the baggie. Bring the baggie to the November meeting for a swap. You will make a quilted gift using only the fabrics in the baggie + one additional fabric of your choice. 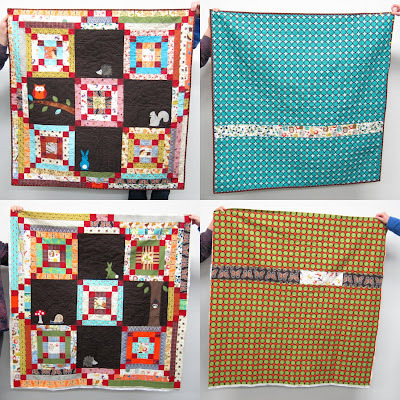 Bring the finished creation to the December meeting to return to the original fabric owner and receive your gift made from the fabrics you donated. 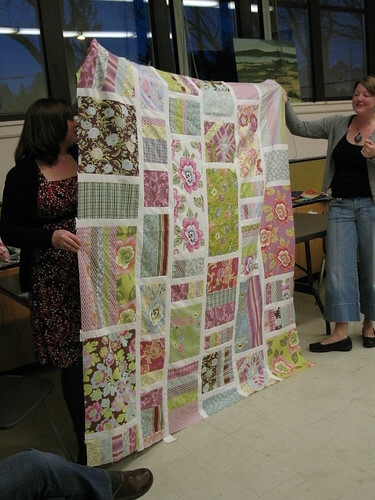 Questions can be posted to the PMQG flickr group page - Portland Modern Quilters. Whew! 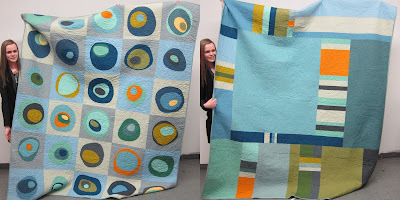 How much quilty goodness can Portland Modern Quilters fit into one meeting? 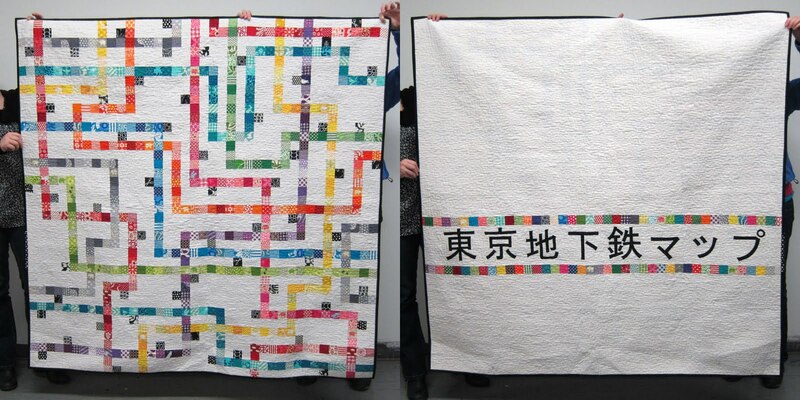 I feel that I may have missed at least one quilt from Show and Tell. Please contact me with any corrections/additions to the "minutes" of this meeting: joanhcallaway@comcast.net.